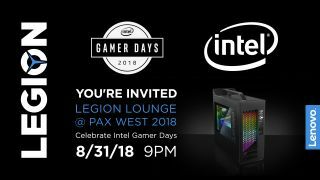 Get your free ticket to The Legion Lounge at PAX West! Join BurkeBlack, Sequisha, FPS fans and your Legion hosts for drinks, games, competitions, and free stuff. Join us for a Fortnite™ dance competition, meet livestreamers Sequisha and BurkeBlack, play the most popular FPS games on Legion by Lenovo gaming systems, strike a pose in our custom photo booth, become an FPS quiz champion, and more as Legion by Lenovo showcases its latest hardware as well as Intel’s® Optane™ technology. Plus, get first dibs on up to $350 in savings on Lenovo Legion gaming PCs, grab free swag, and enter to win a Legion by Lenovo gaming system! Register here before August 27 and join the party! This event is 21+ only. You will be emailed additional details the week of the event. No Dress Code, cosplay welcome. A PAX West badge is not required to attend. Your RSVP does not guarantee admission.